It's that time again, friends... time for my annual Halloween Sketch-Off, where I spend the day drawing S&F characters in Halloween costumes based on reader suggestions. I'll be starting around 11:30 AM Pacific Time this year! I won't be streaming this time around, but I'll post photos of each drawing as I finish it on Twitter and Instagram. If you've got a costume idea for a particular character -- ie: Fuzzy as a Werewolf, Jess as a Witch, Mr. X as Batman, Dev as a Crystal Gem, etc. etc! -- just send it my way on twitter! (Or if you don't use twitter, email it to me.) I'll pick my favourite suggestions and draw 'em up! As always, I'll be selling the completed drawings, so let me know if you see one you like! They'll be $35 each, or $60 if you'd like me to marker colour the art. This year I'm going to go with a more polished style, similar to the Inktober art I've been doing, rather than the quicker/sketchier style I've used in past Sketch-Offs. So there won't be quite as many drawings, but they should look pretty sharp! That's a wrap for today. See you on Wednesday, team! Be aware: This Monday, I'll be doing my traditional Halloween Sketch-Off... where I draw a bunch of pictures of S&F characters in Halloween costumes based on reader suggestions! So start brainstorming your ideas. I'll post the links to where you can suggest, and where you can see the finished drawings, on Monday! I don't think so! As Sam and Fuzzy's story has gotten more and more involved, and the status quo more and more dynamic, it's just gotten increasingly difficult for outside authors to come up with guest strips. Not only is there a lot of continuity to be familiar with, but aspects of that continuity might have dramatically changed between when they drew the strip and when it actually ran! It's also sometimes kind of difficult for me to predict where the spots for the guest weeks will actually be... some chapters wind up running a lot longer than I expect! I still like to take breaks between big chapters, but as you've probably noticed, I've started using those spaces to run goofy one-off strips and other side comic ideas I have. 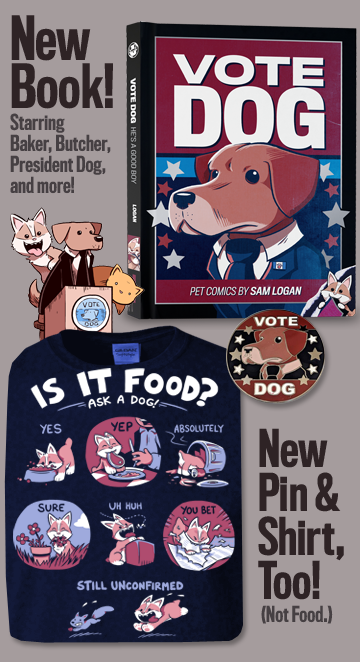 Like President Dog! That's probably how I'll keep rolling for the forseeable future. A lot of different ideas for my next "big" story have been bouncing around in my head over the years, but there's one in particular that I've increasingly zeroed in on as time has gone by. I won't say much about it, but while it is another comedy adventure series, it's one that is completely separate from S&F. That said, when this big Sam and Fuzzy story finishes, I don't think I will jump into another huge multi-book project right away! I will absolutely keep making comics, but I'd like to take some time to explore a bunch of different things... small stories about different corners of the S&F universe, more dog comics, maybe some stories that are "only" one book long. We'll see! But rest assured, while I might explore some other venues for my work, I'll keep the comics coming on these here internets as well. And I'm sure if you've enjoyed the stuff I've been doing up 'til now, you'll dig what comes next as well! "Are you going to be selling your Inktober originals?" -DaveYes! I'm pretty sure I'll put them all up for sale after the month is over. They'll be $35-$45 each, depending on the drawing! I'll make an official page to sell them in November, but if you're impatient and really want to claim one or more before then, just drop me an email! 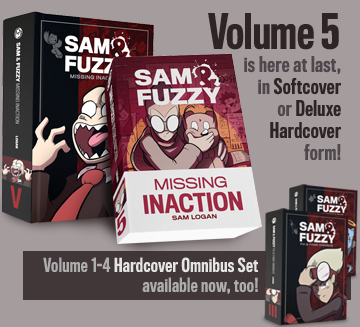 You mentioned previously that this is the last volume that will focus on sam and fuzzy, and that you will probably make a story focused on other characters after, or even something completely new. Can you share any of the ideas you've had or want to pursue? The President Dog saga continues! Come back on Friday for the finale, as well as our traditional Q and A feature. (If you've got a question you'd like me to answer, pop it in an email with "Q and A" in the subject line!) Then next week, it's time to return to some of the rest of the S&F crew for some spooky antics. Meanwhile, my tackling of the Inktober daily drawing challenge continues! All 24 of the drawings I've done so far can be seen on my Instragram, Twitter, or Tumblr. And the drawings for the remaining days will pop up there as I finish 'em! There's a lot of fun stuff... fan art, doggos, S&F pals, and even a couple pin-ups that make careful/stupid use of prop stationery. Enjoy!